Bodhi Wood | The Unseen 'Ip Man' Behind Bruce Lee? The Unseen 'Ip Man' Behind Bruce Lee? Singapore -- The mild-mannered 'Ip Man' (pronounced 'eep-mun': Bruce Lee's martial arts master) is a refreshing break from the typical genre of screen Kung Fu heroes. Come to think of it, Ip Man is in many ways the direct opposite of Bruce Lee's famous brash screen personas. 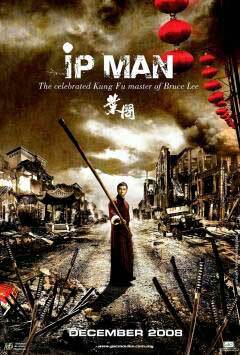 Then again, what we witness in the film 'Ip Man' is just another screen persona played by an actor too? Instead of being hot-headed or fantastically fancy in pugilistic moves, Ip Man is disarmingly humble. He is so unassuming during most of the featured fights that he almost takes the fight out of fighting. Yet, he who wins with minimal or even no violence is a true victor indeed. Unlike the norm of the day, when arrogant pugilists challenge one another to prove themselves, Ip Man even hesitates to take up challenges deemed unnecessary, often politely turning them down. Ip Man earns much respect by giving respect - even to those who lose in sparring matches with him, who were not really respectful enough of him in the first place. He neither gloats about winning or condemns the losers. Because the losers realise that he had graciously and unconditionally given them much leeway and face, they are greatly humbled by his magnanimity. Buddhists would see Ip Man to be masterful with the practice of maintaining an 'ordinary mind' - the attitude that does not make a big deal out of the shifty worldly winds - whether they blow his way or others. These winds are after all but winds of change, of alternating praise and blame, gain and loss, fame and shame, pain and pleasure. A true hero must not just be a physical one - he must be a spiritual victor too. Even a gracious loser ultimately 'defeats' an arrogant 'winner'! The arrogant is always haughty too soon - though there is never really a good time to be haughty. The winner of a prize is not always the winner of peace! Arrogance is a defilement that invites enemies who might be haughtier than oneself! It also humiliates the losers, readily transforming them into potential enemies. Such is the trouble with being obsessed with dualistic victory and defeat - on both sides. The Buddha couldn't have put it any better when he warned thus in the Dhammapada - 'Victory begets enmity. The defeated dwell in pain. Happily the peaceful live, discarding both victory and defeat.' Even if it is not possible to totally discard all forms of victory and defeat in this competitive world, one should train to be able to win while winning any cockiness in oneself, to lose without losing confidence in oneself. Even if the world competes with you, one need not compete with it. Any gains or losses are just impermanent and unsubstantial by-products. Facing guns held by an oppressive regime, what good can a martial artist do with his skills? How can he fight for justice? By not doing it alone if he can help it - but by inspiring the masses to stand up together. The odds will always be against the lone hero - but real heroes are the ones able to urge more to be heroic. In his war-torn homeland, Ip Man trains the ones he could to at least be able to defend themselves. How obsolete, one might think, martial arts are, in the face of guns. Then again, doesn't it offer the most fundamental physical defense? How can this skill ever be outdated? The enemies are not always armed too, while a good martial artist can disarm the armed! Anyway, martial arts are commonly practised as a form of discipline, exercise and art. When taught with honourable ethics, they can be a skilful means of imparting spirituality too. Just think Buddhism-inspired Shaolin Kung Fu.